Anyone from Mopar reading this? The Jeep Gladiator opens the doors for all kinds of off-road adventure possibilities. Sure, a Wrangler or Wrangler Unlimited can easily handle most driving tasks, but having a full truck bed at one’s disposal for modification purposes presents endless opportunities. The folks over at Jeep Gladiator Forum have taken it upon themselves to create a bunch of renderings showcasing what can be possible for overland upgrades. Is anyone from Mopar checking these out? They really should. For anyone who doesn’t already know, the term ‘overland’ means precisely that, traveling overland. People have been modifying pickup trucks for killer overland adventures for years. Toyota Tacoma and Tundras are two of the more popular choices and we fully expect the Gladiator will jump to the top of the list. To make a proper overland truck, one must convert the bed into a living space that provides just enough for the basics: sleeping, storage, and anything else one deems essential. The newly created roof space is also used to its full advantage. These renderings, to varying levels, show what's possible with the Gladiator. We also checked out the official Mopar catalog and, so far, there’s nothing available to turn Gladiators into fully-fledged overlanders. But give Mopar some time. The 2020 Gladiator has just gone on sale, starting at $35,000. The Launch Edition will set you back over $60,000, assuming you manage to snag one. 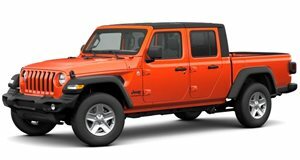 Jeep designed and engineered the Gladiator to not only be a true pickup truck but also a segment disruptor. It has a best-in-class tow rating of 7,650 pounds, payload of 1,600 pounds, and plenty of standard off-roading essential features like heavy-duty Dana 44 front and rear axles and four-wheel-drive. The top grade Gladiator Rubicon adds lockable wide track axles, an electronic disconnecting front sway bar, Fox shocks, and 33-inch all-terrain tires.